Hey everybody! Summer is over, leaves are falling from the trees, Hello fall. Love spending time in the woods this season so perfect conditions to make beautiful pictures. 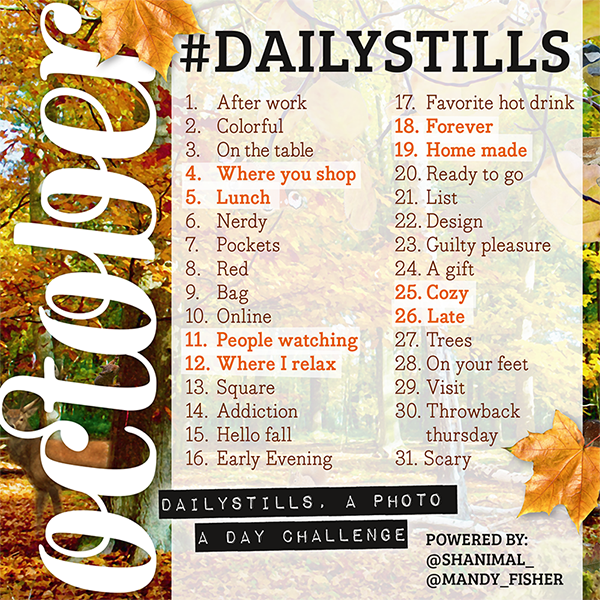 We've made a fall themed Dailystills for October and I hope you're gonna enjoy it. Are you joining us in October? Let us know on Instagram :) My IG account @shanimal_ and Mandy: @mandy_fisher. You're allowed to save this photo and share it on Instagram too, enjoy! ♥ Take a photo using the prompt as inspiration. So for October the prompt for day 1 is ‘After work. So take a photo when you're done with work, or something you do after work, you name it!